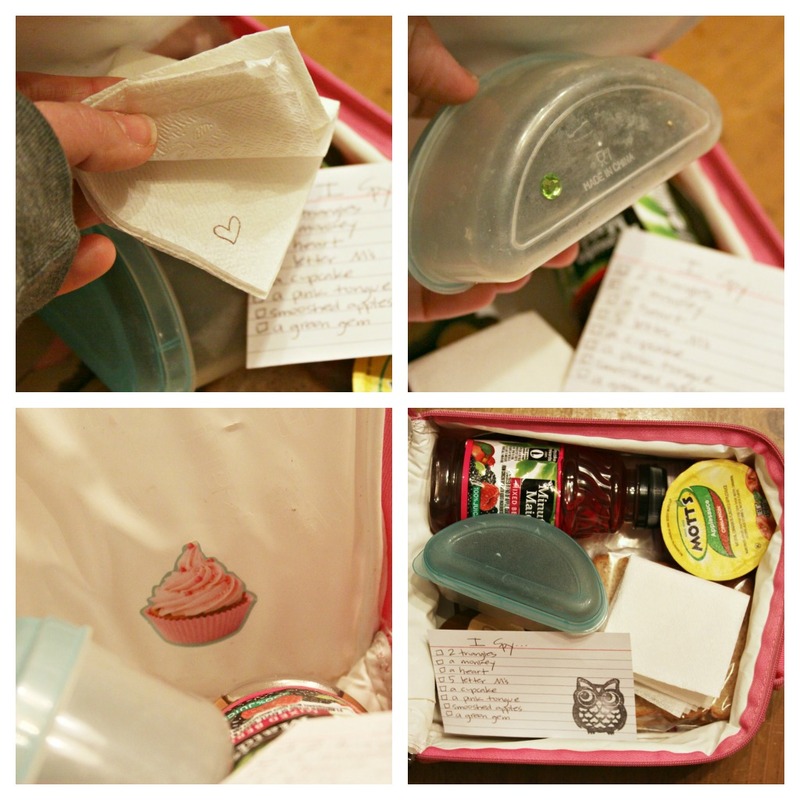 When I pack the occasional lunch for my kiddos for school, I like to write a note & leave it tucked inside. In fact, my 8 year old told me that when I make her lunch, the best part is the note! (The pressure is on.) And, like every other lunch-packin'-note-writin' momma out there, I get stumped for original ideas on what to write. I seriously just say the silliest most nonsense things to get by. Such as: "Your cookies told me you could eat the sandwich first." If not you will starve. Knock-knock jokes are always a favorite. But this morning I had a lunch note epiphany. 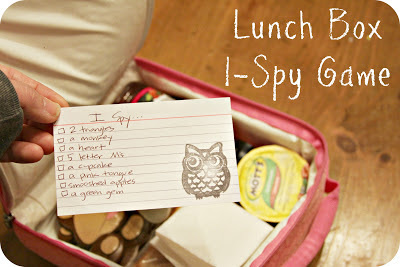 The classic "I Spy" game IN their lunchbox! I quickly wrote up the clues & stuck them in Pazely's box. Of course you'd make up your own clues. Make as many or as few clues as you want. Make them as easy or as difficult as you'd like. The cool thing about the "I Spy" lunchbox game is you can make it different every time! It'll save having to think of yet another note. Oh, & I'll trade you my banana for your Oreos. Deal? UPDATE: Pazely came home from school after I had done the "I Spy" game in her lunchbox & said that a bunch of her friends at the lunch table were crowding around her, trying to help her find the clues. They ALL said, "Tell your mom to do that game again next time you bring your lunch & I'll help you find stuff again."